76% of organizations said they experienced phishing attacks in 2017. Nearly half of infosec professionals said that the rate of attacks increased from 2016 to 2017. 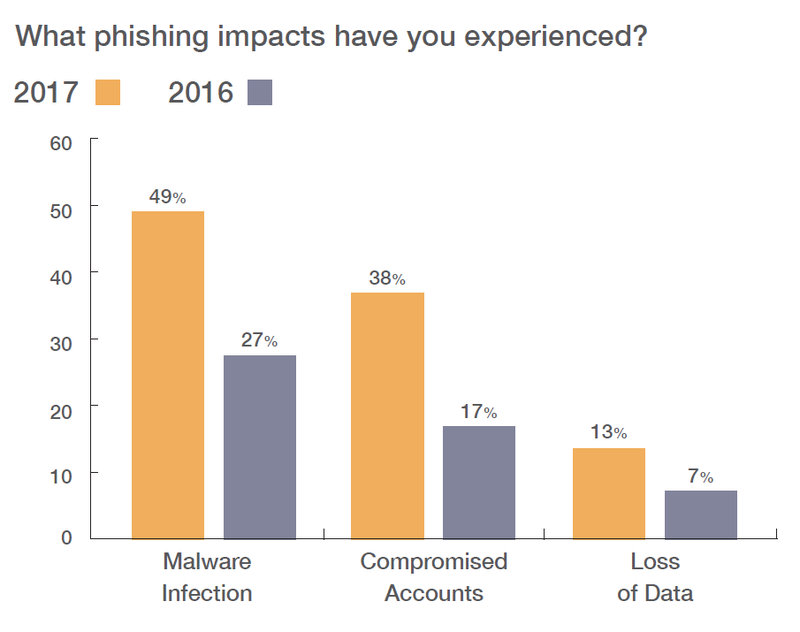 The impacts of phishing were more broadly felt than in 2016, with an 80+% increase in reports of malware infections, account compromise, and data loss related to phishing attacks. UK organizations are more likely than their US counterparts to rely on once-a-year training models and passive security awareness training tools (like videos, newsletters, and email notifications). US organizations — which favor interactive training methods delivered on a monthly or quarterly basis — are more than twice as likely as UK organizations to report quantifiable results from their efforts. Smishing is a threat to watch in 2018. Our data shows that average failure rates on simulated smishing attacks are the same as those on email phishing tests. However, just 16% of global technology users surveyed were able to correctly identify the definition of smishing in a multiple-choice query. This article was on the Wombat Security blog by Gretel Egan and has been republished with permission.